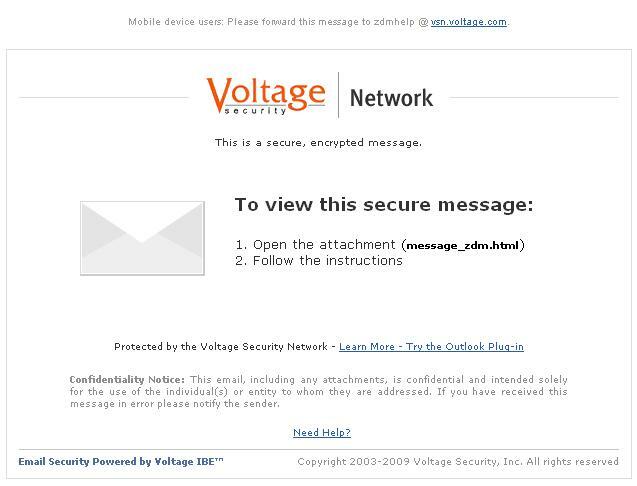 The Voltage SecureMail Cloud makes sending encrypted email and encrypting your files easy! Just install the Voltage software and you will be protecting your information in less than a minute. 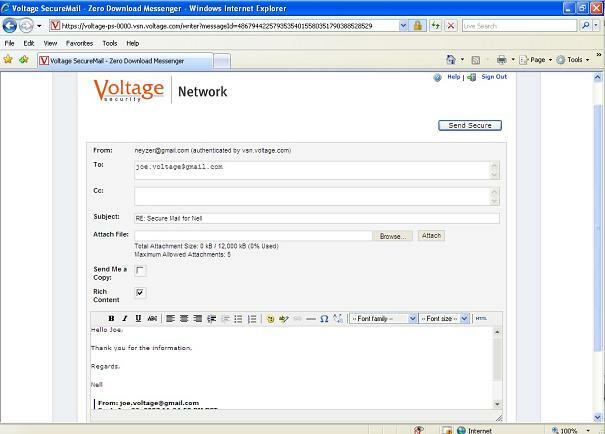 You can also use the Voltage SecureMail Cloud Web Interface (Zero Download Messenger) to send secure, encrypted email to anyone! 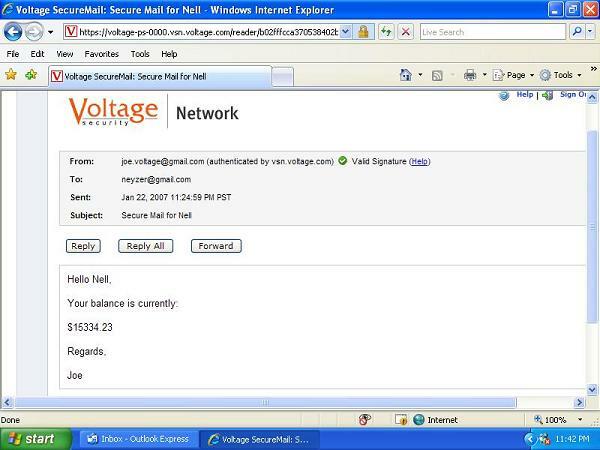 During use of the Voltage SecureMail Desktop plug-in or the Zero Download Messenger, you will be asked to provide your email address (identity or ID). 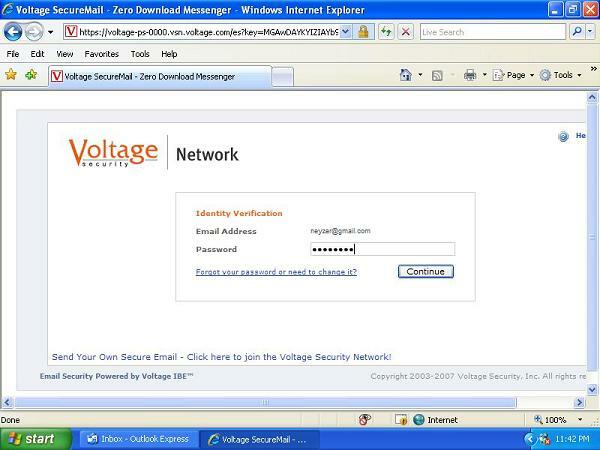 Choose a password and Voltage will verify your identity by sending you a verification email. Click on the link in the verification email and you are ready to send secure email. Click Here for a 3 minute Demo. Sending secure email is easy – just compose your message, add recipients and press the ‘Send Secure’ button in Outlook or Outlook Express. The email will be encrypted and sent to recipients with your digital signature incorporated in the message. With the Voltage SecureMail software, the decryption process for incoming secure messages happens automatically. 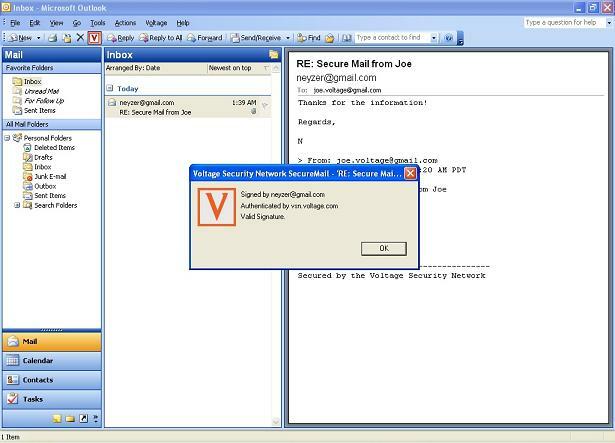 Each secure email received also has a digital signature that is displayed with each decrypted message in Outlook Express or viewed by clicking on the highlighted ‘V’ button on the Outlook toolbar. The digital signature identifies the sender of the email and protects the recipient against spoofing. Any message with an invalid signature will automatically bring up an alert to the end user. If a key is required to decrypt the message, you may be prompted to authenticate yourself. Once you have authenticated, the secure email will decrypt and reveal the contents. To reply to secure email, click on Reply as you normally would to compose the message. To reply securely, compose a message and click on the ‘Send Secure’ button. Your reply will automatically be encrypted, signed and sent. Based on the breakthrough Identity-Based Encryption technology, Voltage SecureMail makes sending secure email as easy as sending it without encryption. The Zero Download Messenger allows your recipients to receive and reply to secure email without the need to download any software. This option provides assurance to recipients that their secure email can always be read no matter what the email or desktop environment is. Click Here to see a 2 minute Flash Demo of ZDM. 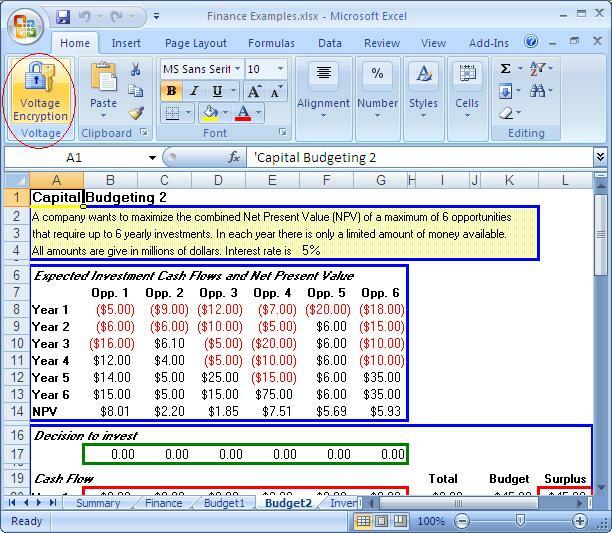 Open the attachment titled "message_zdm.html" to access your secure email. Click the "Read Message" button. With each secure email, there is an HTML attachment titled “message_zdm.html” that provides access to the Zero Download Messenger. 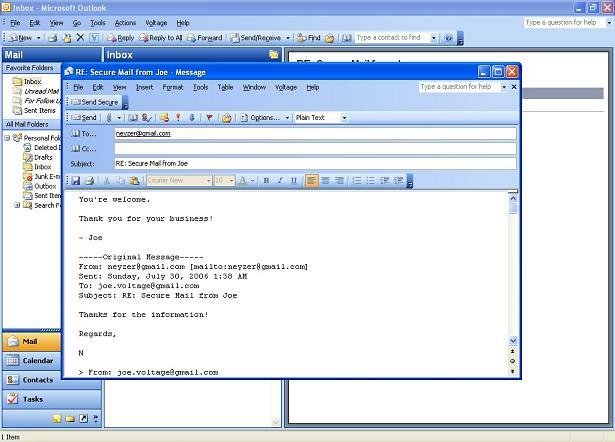 The encrypted body of the original message as well as any attachments to the original email is contained in this HTML attachment. By opening the HTML attachment and authenticating yourself, you will be able to access your secure email and attachments. After opening the message, you may be prompted to authenticate yourself by an email sent to the email address that you selected (or asked for a username and password if you have previously registered). Once you have authenticated, the secure email will decrypt and reveal the contents. The decrypted secure email will be presented to you in your web browser over a secure SSL connection. The digital signature identifies the sender of the email and protects the recipient against spoofing. Any message with an invalid signature will show an alert. Once you have viewed your secure email, you can reply to the originator, securely. To reply to a secure email via the Zero Download Messenger, click on ‘Reply’ or ‘Reply All’ to compose a reply message. Compose your message and click on the ‘Send Secure’ button – Your reply will automatically be secured. You may also upload attachments to be sent securely to your recipients. 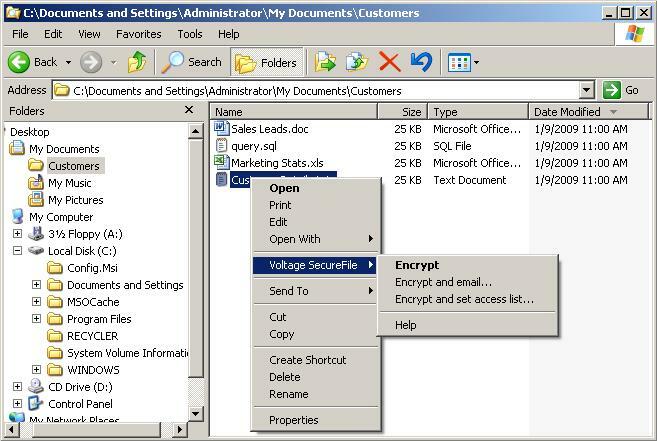 With Voltage SecureFile you can encrypt any file by simply right-clicking on a file. You can encrypt to yourself or grant access to additional users. The encrypted file will be saved as a PDF file in the Voltage SecureFile format. Users without Voltage SecureFile software installed will be directed to a SecureFile Reader download page when they open the document. The SecureFile Reader is a free download for all users. 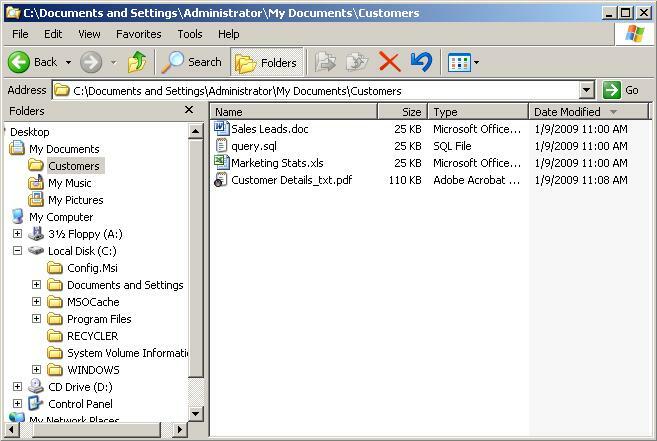 Integration with MS Office allows you to encrypt Office documents with Microsoft's Information Rights Management feature. Just add users and select what permissions each will have. 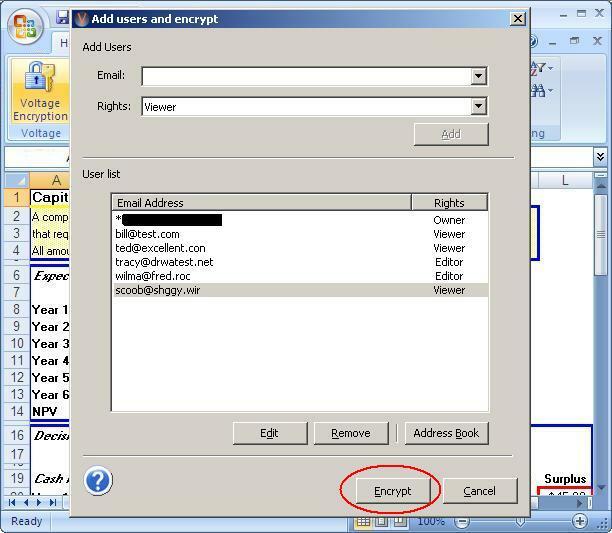 Click the Encrypt button and the document will be encrypted and saved in Office format. Only the owner and the designated users will have access. Users without Voltage software installed will be directed to a SecureFile Reader download page when they open the document. The SecureFile Reader is a free download for all users.